Whilst I have used soldering stations at work etc, up until now I have made do with just standard plugin irons at home with varying degrees of success. As I have started to do more electronics of late I decided it was time to purchase a soldering station for use at home and maybe take to fizzPOP. 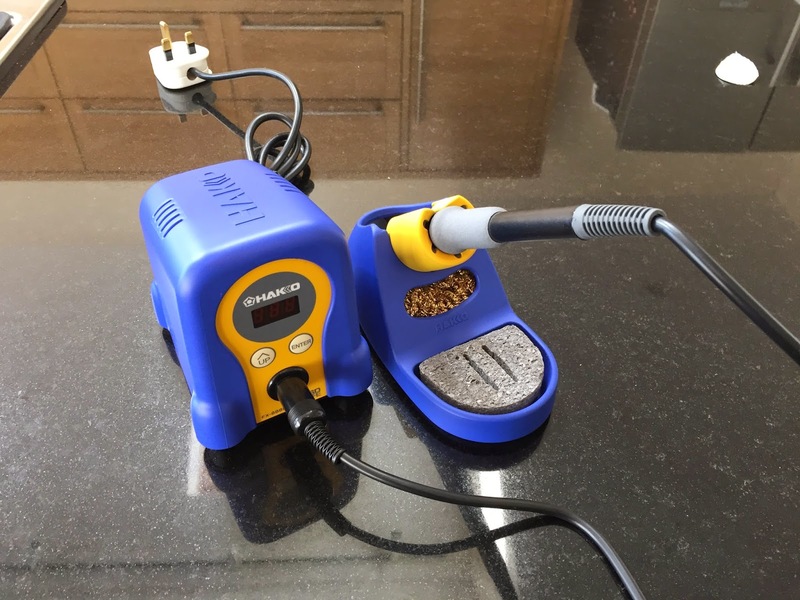 Having decided to purchase a soldering station, I have spent the last few months reading many blog's and watched many YouTube videos trying to make my mind up on what soldering station to buy. I quickly discounted the cheaper options from the likes of Maplin but equally decided it was not worth spending a fortune on features I was never going to benefit from. In the end I decided my budget was £100 - £150 pounds. For which I was looking for a 50w iron, with a 200c to 450c temperature range and with separate iron tips and heater element. I soon narrowed my search to either the Hakko FX-888D or the Weller WES51. I had at first wanted to go with the Hakko FX-888 as I prefer an analogue knob for temperature control but unfortunately it has been discontinued. I was drawn to the Weller WES51 because it had analogue control but in the end I have opted for the 888D mainly due to its slightly higher power at 65w and its all round great review online. The next problem was finding someone who sold it, which was a lot harder than I expected. A quick search on eBay found them available for around £65 pounds which seemed a bit too good to be true and like most things that seem too good too be true it was. It would appear that there is a real problem on the market with counterfeit Hakko equipment. In the end I emailed Hakko and they sent me the details of there two UK resellers, Grosvenor Group and Dancap Electronics. Neither site left me with much of a urge to contact them. Grosvenor seemed to be aimed at much larger clients and had no pricing and the Dancap site looked as though it was styled 20 years ago. Despite the basic styling I ended up contacting Dancap and was really glad I did, the customer service was excellent and Paul was happy to talk through options and make suggestions. The only slightly odd thing for this day and age was that they don't accept credit card or Paypal so I ended up paying by bank transfer. In the end I spent £144.52 on the solder station, iron, a few tips and delivery, which was at the upper end of my budget but for once still within. My order arrived the next day and was very well packaged. I am certainly happy to recommend Dancap and I am sure I will order from them again in the future myself. So what do I think of my new purchase, Well so far all I have had time to do is unpack and check it heats up but things are looking promising. The iron feels nicely balanced in the hand and I really like the way the iron sits in the stand. The overall build quality seems to be very good but only time will tell, as soon as I get around to using it I will let you know how I get on.